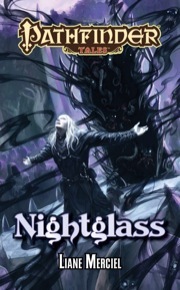 Nightglass is sanctioned for use in Pathfinder Society Organized Play. Its Chronicle sheet and additional are a free download (270 KB zip/PDF). An interesting protagonist, but not one of my favorite protagonists. The redemption story--or at least its beginnings--however is well-done. The earlier Nidal experience was quite a heady experience, no holds barred. Probably best recommended for a mature audience, shall we say. I saw the Strix, in the far west of Cheliax, like the Native Americans in this country. A poor writer would have made them into "noble savages", but Ms. Merciel is quite the opposite of a poor writer. They were what they were; and lived life on their own terms in a hardscrabble existence as best they could. Others have pointed out a few glaring editing mistakes but overall it was pretty good. Nightglass is a Pathfinder Tales novel that's very different than the norm. It's not about adventurers on some sort of quest, but instead a book that traces, from childhood to adulthood, the life of a single individual. The novel is set in the country of Nidal, a dark but fascinating place where the rulers (and, by necessity, most of the people) have dedicated themselves to a god of pain and shadows. It's not easy to imagine what everyday life would be like in such a foreboding place, but author Liane Merciel does a fantastic job bringing Nidal to life. The book's main character strikes me as a touch bland and (no insult intended!) a bit too much like Drizzt Do'Urden, but on the whole this is an excellent job that adds more depth and range to the official Pathfinder campaign setting of Golarion. We need more clever and original books like this! The book's main character, Isiem, is taken from his rural village as a child when he shows aptitude for the arcane art of shadowcalling: contacting and manipulating the evil and hungry forces of the shadow plane! The novel follows Isiem's training at Dusk Hall in Nidal's capital city of Pangolais, and we see what a very evil Hogwarts would be like. (There's something in there called Joyful Things--jeepers they're creepy!) The students who survive and progress in their studies at Dusk Hall are eventually initiated into the faith of Zon-Kuthon in a ceremony (the Needled Choir) that is ghastly but a perfect encapsulation and explanation of the faith's tenets. As often as role-playing scenarios are about heroes defeating evil cultists, it's really unusual to see the inner works of those evil faiths. After being assigned to help (and spy) on a Chelaxian envoy, Isiem starts planning his escape from Nidal. Isiem's character isn't easy to pin down. He takes no joy in the evils deeds he's often asked to do as part of his studies and has no innate respect for the tenets of his faith and government. Yet, although he sometimes tries to curb the worst of their excesses, he's definitely not a heroic type of character. He's a survivor who wants, most of all, to be free--and that's why the comparison to Drizzt's escape from the Drow strikes me as an apt comparison. The second half of the book shifts to a remote town in Cheliax called Crackspike where silver has recently been discovered. Isiem is sent with a contingent of Hellknights (because Nidal cooperates with Cheliax by making its shadowcallers available to them) to pacify the birdlike strix that have been warring with the miners. The novel shows great insight (and adds worldlore) for the strix, creatures I haven't encountered in much Pathfinder fiction. After the strix overrun Crackspike, Isiem becomes their ally because he showed mercy to one of their warriors during the battle. He helps the strix in a later battle against Chelaxian reinforcements, and helps to negotiate a peace treaty between the two forces. It's an odd and unpredictable turn of events for the character, and although it ties into his freedom from Nidal, I'm sure if it fits the theme of the book as well. Nidal is such an interesting place that I'd rather see more of it than follow the life of one of its escapees. Despite the review ending on a bit of a down note, Nightglass is an excellent novel and definitely worth reading. It has single-handedly turned a particular aspect of Golarion from an interesting idea to a fully fleshed-out and believable place, which is no small feat. Wow, that flew by too fast I want more. The only drawback to this story was it wasn't long enough. I loved the path of the main character and the dark and gory details of his life. This book was wonderfully bleak and fantastically uplifting at the same time. I truly enjoyed this novel. I enjoyed this book much more than I'd expected to, given its subject matter (the torture-loving nation of Nidal). Isiem is a wizard who descends into a moral wilderness under the rule of the Umbral Court, and then finds his way to a kind of redemption in the end. Some reviewers have complained about the two parts of the book not holding together very well, but I didn't experience that. There's lots of food for thought here, more than what I'd expected from a fantasy novel. Some of the questions Merciel raises are: What does it truly cost to cling to one's nation, tribe, or land? Can people ever truly atone for the evil they do? Ought one's morals and principles be sacrificed in order to survive, and is that ever justifiable? This novel is actually pretty deep. Despite all of the action in it, a lot of it is about Isiem's inner journey. Also interesting that this is off the quarterly pattern established for Tales so far. Is this a one off, or is the line going to be more frequent? There's no official frequency set for the line yet, but we do intend to pick up the pace a bit. Wow! I need to check the official list of upcoming books a bit more often than once every 3 months! This looks interesting. I enjoyed Certainty when I read it sometime last year, though I remember it being rather bleak. I like stories of redemption, though. Redemption is always good! The ISBN listed previously was incorrect. Fixed. Heeyyy how did I not see this until now. I like that mock-up art a lot; it actually works pretty well for the book. Ooh. Gonna be a long wait 'til June. Having read Heaven's Needle I can say that Liane + Nidal is a combination I'm very eager to read the result of. Are these the winged humanoids going to be strix? Based on the seminar at last year's PaizoCon (which I, purely by happenstance, was listening to this saturday morning), I'd say odds are they're strix. Really eager to see a character written with a Nidalese mindset, to get inside the head of that culture. Turned in the revised manuscript last night. I think this was the most fun I've had writing a book. I'm not promising it'll be any GOOD, mind you, just that I had fun scribbling on it. I will purchase and read this book. I not promising that I'll ENJOY it, mind you, just that I'll read it and write a review. This will be my first experience reading this author's work, so I'm looking forward to it. Certainty was brillig, definitely looking forward to this. Sounds like she hit that Nidal/Kuthonite sweet spot then! "Wow, this is really interesting, and I can see where these people are coming from to a degr- OH GOD!" No, no, no Liane. You're supposed to say "This is gonna be AWESOME." It's not self-aggrandizement . . . it's marketing. Final product description and cover are now up. So... there's gonna be shadow-thingies in this, yes? Durn! I should have learned to recognise his stuff by now. I will tell you a secret: I've never actually liked any of the covers my books have gotten. UNTIL NOW. I kinda liked the one for Heaven's Needle. Bitharn looks like she means business. I am so looking forward to this! Finally! N I D A L! Oh, and shadowcaller. Is that a neat-o superflavorful version of Golarion's summoner?! Oh hey this is out! In my hurry to get the ARG I missed this release. ORDERING. Ah, this should be fun. I've always loved shadow magic. Looking forward to the "shadow thingies." Woot! I love Strix. I've wanted to see them fleshed out since the Inner Sea World Guide! The technic league and then shadow magic, right after each other? I'm in heaven. I have to say that I didn't expect to enjoy this book as much as I am. I am in chapter 6 now and haven't been able to put it down. I've been curious about the role of the strix since I ran council of thieves. This book was quite good. The most wizardy book in the pathfinder line so far, and done very well. Though I feel the Scrysphere was kinda just dropped as were other things. It seems generally you introduce those sorts of things to create plot points of interest later in the story, here they were just used to illustrate what a wizard in the position would actually cast/do. -> A very good read. (1) It's a pretty useless spell to actually spend time and money learning, since you only need to cast it once to graduate and most wizards aren't going to want to cast it too often, seeing as it costs a body part every time you make a sphere. This is even more true for sorcerers, and we know through Ascaros that there are at least a few sorcerers in the Dusk Hall. So there is a demand for Scrysphere scrolls, and it is through exploiting that demand that Isiem racks up enough money to buy the priest for the Festival. (2) It's through the Scrysphere that he figures out what's going on with Helis and the demon in the library. Other scrying spells might have been detected by the target, but Scryspheres are specifically noted as not registering to most forms of detection. Therefore, it's Isiem's best method for spying on a fellow wizard. Thanks for the explanation! That makes more sense. Myself and a friend are finding some serious editing errors in the book. Has anyone else noticed these or are we mistaken? I do recall there being one where a character's name was wrong in a sentence and I had to read it several times before I figured out it was a typo rather than me completely misunderstanding, but that was minor overall. Nothing like when I read Masterminds of Mars and there were several pages that were a duplicate of the previous several pages (and therefore several pages were outright missing), and which was NOT a printing error (since it started repeating in the middle of a page) but was some kind of horrific editing error. Yes, I also remember that sentence where the character's name had been obviously swapped with another, but I cannot remember where exactly. Some minor typos can be found too. Nothing that has stopped me from giving it a five star review. Page 92, paragraph 4. "What happened to Isiem..." should be "What happened to Loran..."
I really could've done without the graphic depictions of torture. If the author's intent was to make the reader hurl, then she succeeded. I hurled the book across the room. I am not sure I will finish reading it. @Snapdragon: Don't ever read Gerald's Game. Just sayin'. Another error I noticed was at the bottom of page 46. Written about a one-armed woman: "She raised her other hand..."
That and the one gbonehead and snapdragon mentioned were the two biggies. In both cases, I had to go back and re-read a little bit to make sure I hadn't missed something. Once I realized it was just an editorial gaffe, I happily went on reading the book (which I gave a 5 star review - I thought it was amazing). But for those two instances, my immersion was disrupted. Punctuation mistakes don't take me out of the story like that. That said, I can't say enough good things about this book. I've read all of the Pathfinder Tales, and this and Death's Heretic have been my two favorites. I really, really hope Ms. Merciel writes for the line again!!! I also agree completely with this. This is a wonderful book. The prose is elegant and poised, the characterisation believable and intriguing. The magic is especially good, I could recognise most spells that were cast but they still felt like natural products of Isiem's training and were never awkward. At the end, I couldn't help comparing it to Homeland (Salvatore's Drizzt origins story), both are tales of people raised in evil societies and expected to be impressive members of that society who instead reject it and seek an opportunity to escape. However, Isiem is a more conflicted and believable character, his redemption less neat but more satisfying and his relationships more intriguing. After two books in the line that left me hesitant (the central character in Song of the Serpents was utterly unlikable, City of Fallen Sky was poorly written) Pathfinder Tales has been completely redeemed and hit a real winner with Nightglass. I really, really hope that Liane Merciel writes more for Paizo, she is my second favourite Pathfinder Tales author, narrowly pipping Laws, Sutter and Jones (equal third) and only falling behind Gross because of his light, deft, playful wit. If this book actually showed up at one of the bookstores in my city. Chapters has the release date as tomorrow. When it's been out since what, the 3rd or so?